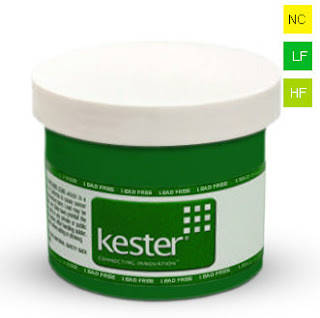 Kester Solder Paste is available in 8 different formulas. These formulas include Kester NXG33, NXG1, EM907, EP256, EP256HA, EM828, R562, and HM531. Janel is an active distributor of these pastes and is proud to be the single largest, woman's owned stocking distributor for Kester Solder Products. For the next several weeks, we will be taking time to focus on the various Kester Solder Pastes Kester manufactures. Kester NXG33 is a No-Clean, Lead-free, Halogen-Free solder paste developed for users facing the most technological advanced difficulties in modern electronic assembly challenges. This Kester Solder Paste can successfully print and reflow 01005 components (including with air reflow) and with a minimal graping behavior. NXG33 can handle a wide array of printing variables such as speed of print, lengthy periods of time, as well as large ranges of humidity and temperature fluctuations. After soldering, this paste will show a reduced amount of defects in comparison to other soldering paste competitors. These reduction of defects may include QFN/BGA and head-in-pillow voiding. Kester NXG33 meets the IPC definition for halogen-free paste and is classified as ROLo per IPC J-STD-004B. Kester NXG33 Lead-Free Solder Paste is available in two sizes. This Type 4, poweder, with the SAC305 alloy is available in in both a 500 gram jar and a 600 gram cartridge. Kester Solder Pastes in lead-free options are also available in other formulas including the Kester NXG1, EM828, and EM907 formulas. To shop these formulas click here. Kester products are recognized worldwide for their premium quality and Kester prides itself on their dedicated environmental responsibility.